For the past few days, I've been recapping various sessions that Shaun and I attended at the Oklahoma Council of Teachers of Mathematics Summer Conference. So far, I've recapped High Yield Geometry Routines and Fun Functions. Today, I want to share what I learned from a session called "Taking the Practice Out of the Worksheet" by Judy Schwarz (her name is misspelled below). There are SO many good ideas in here! Apologies in advance for the picture overload that this post is sure to become! I guess I didn't read very carefully because I didn't realize this was a geometry session. 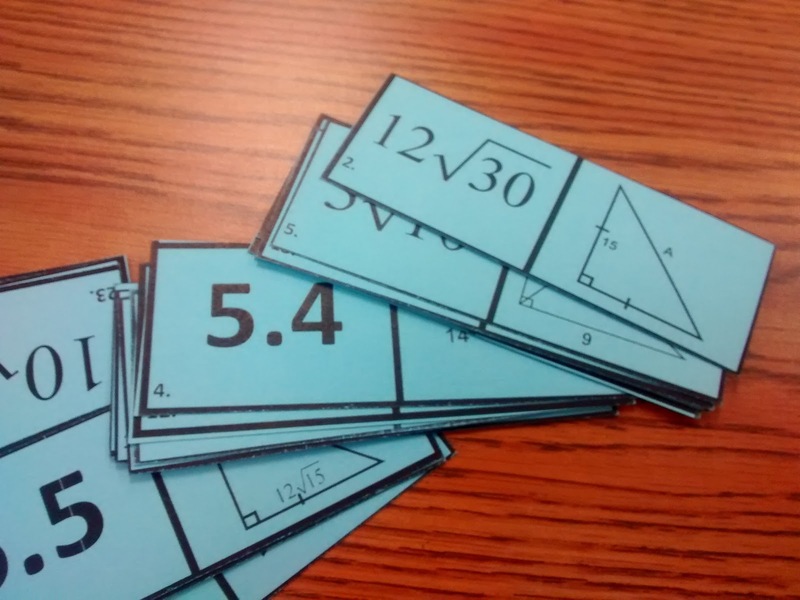 Thankfully, even though a lot of the ideas are for geometry, they can be modified for any math classroom. The facilitator just happens to teach geometry, so that's what form most of her ideas are in. The first idea that Judy shared was to have students make "If...Then" posters at the beginning of the school year. She said she often has students do this before they've ever even talked about conditional statements. If I remember correctly, she usually has students complete this as homework. But, if you have access to a stack of magazines, you could even have students do it in class during the first week. If you eat spicy food, you need to brush your teeth. If you own a lot of dogs, you have to buy a lot of dog food. 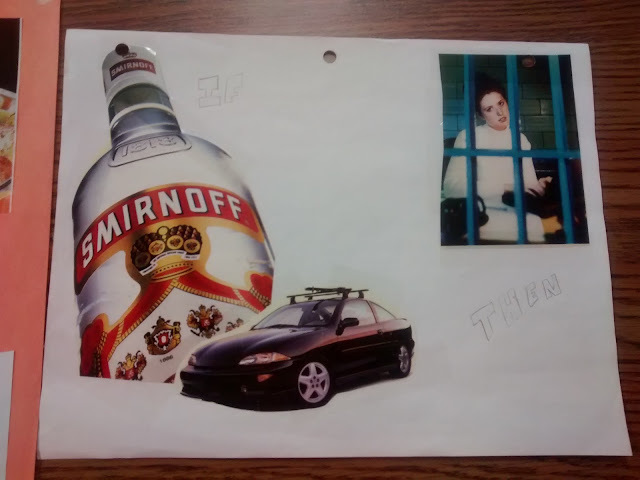 If you get caught drinking and driving, you will end up in jail. The facilitator said she hangs these up around the classroom for instant decorations. 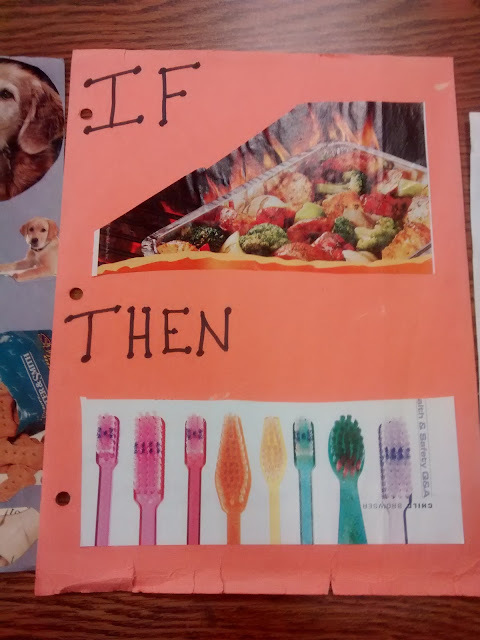 Then, when they begin the unit on conditional statements, she has students work problems from the posters made by their students instead of from the problems in the textbook. 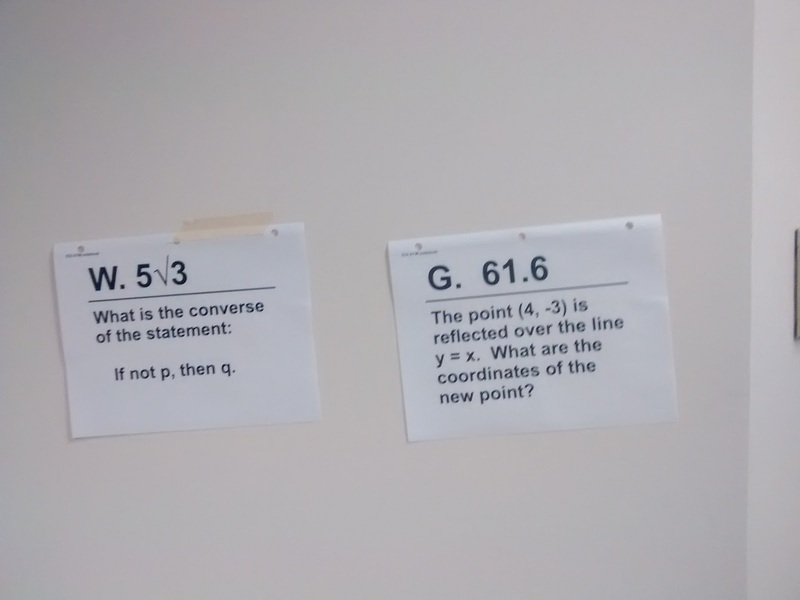 Students will have to pick a poster from the room and write the converse, contrapositive, etc. By starting with real-life examples, students are more engaged. Eventually, they do move on to the problems in the textbook. * Give students a textbook section to read. Set a timer. * When the timer goes off, the teacher closes his/her textbook. * Students take turns asking the teacher questions that could be found in that textbook section. * After the teacher feels like she has an idea of the students' understanding of the concept based on their questions, the tables are turned. Now, the students close their textbooks and the teacher starts calling on students to answer questions. 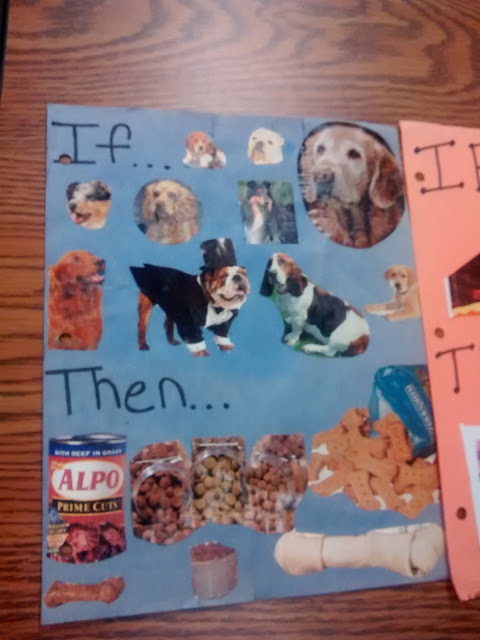 This activity gets students reading and re-reading as they try to formulate questions to ask. Students need to think about what the main ideas of the lesson are and what common sources of errors might be. The teacher makes sure to pull out important ideas not brought up by students when it is his/her turn to ask questions. A quick google search led me to another more thorough explanation of this activity. This next idea is so simple, but I think it's definitely a keeper! At the end of a chapter or unit, have a students make a list of the top 10 things they learned. This could be done as a homework assignment, or you could give students a few minutes in class to complete. Then, put students in groups. They must each read their top ten list to the group and compile a top five (or top three) list that is agreed upon by all members of their group. Judy claims that this simple activity gets kids talking about math and justifying their answers. The discussion helps kids really concentrate on what the key ideas of the unit were. Remember my interactive notebook dividers for next year? I'm already thinking about replacing the bit with the pretty picture to be a place for them to record their top ten list. This is an idea I've used in my own classroom, but I've always referred to it as a "Scavenger Hunt." Students choose one poster to start at. After working out the solution to the problem on that poster, they search the other posters for the poster containing the appropriate answer. Then, they solve the problem on that poster. This process continues until you circle back around to where you started. Students are given a set of requirements of what must be in their self-portrait. 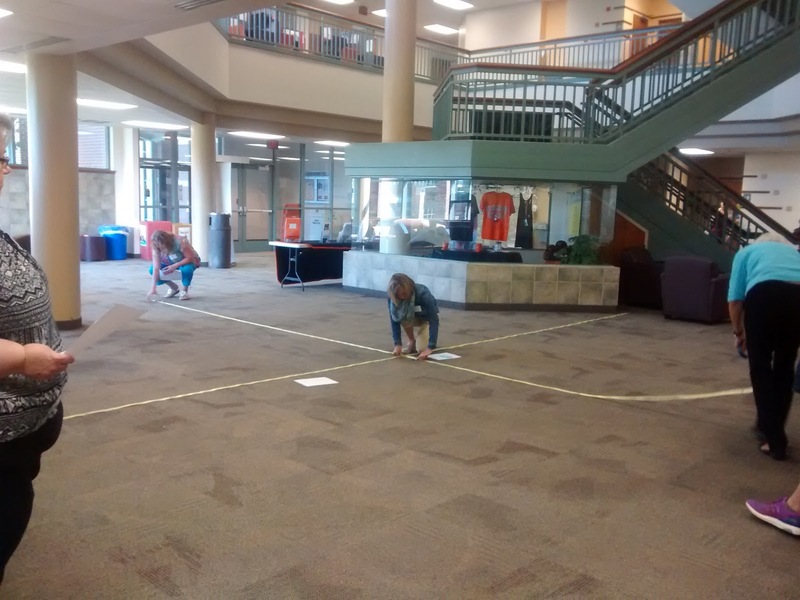 Students MUST use a ruler when completing the project. Students peer grade each other's projects using a rubric. I really liked Judy's explanation of how she has her students peer grade each others' projects. She takes up all of the projects, shuffles them, and hands them back to students to grade. She makes sure that best friends aren't grading each other's work. Students use a copy of the rubric to grade another student's project. When students are done grading, they take the original project and the rubric and deliver it to the student it belongs to. Each student looks at the rubric and decides if they agree with the grade they have been given. 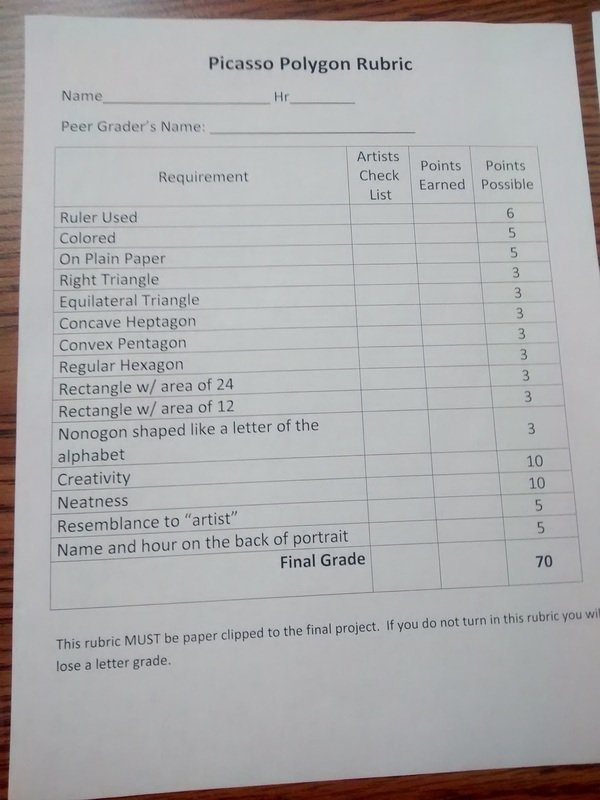 If a student disagrees with the way they have been graded, they take a colored sheet of paper and staple it to the top of the project with why they disagree with the grade the other student gave them. When the teacher is entering grades, he/she just need to double check the projects that have colored sheets of paper on top. The next activity we did was called Leap Frog. This was a review game that was totally new to me. That's always exciting to experience at a conference! Each student is given a deck of cards. This will be their answer bank. Judy suggested printing each deck on a separate color of paper. If this isn't feasible, have the first set of students who use each deck write their initials on the back of each card. Then, if a card gets dropped in the floor during clean-up, it can easily be reunited with its friends. 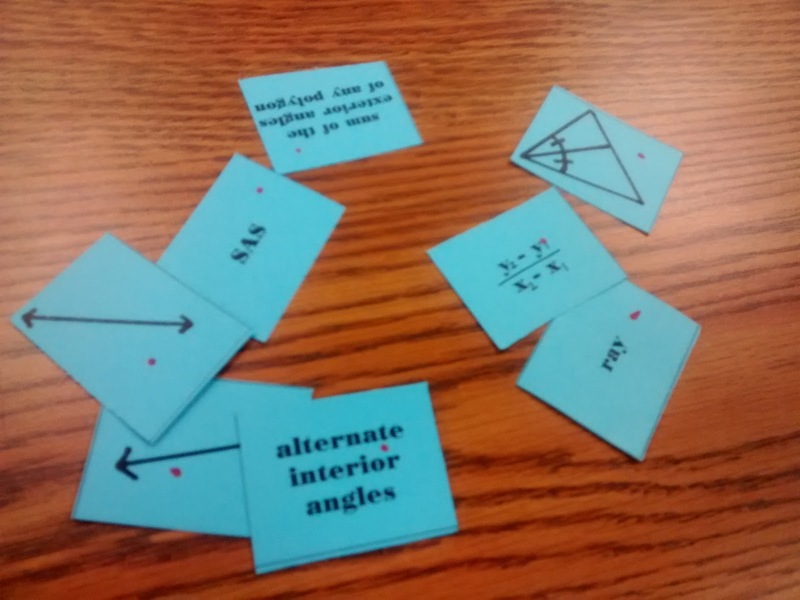 Students arrange their desks in a circle, and each student lays out their deck of cards. We played Leap Frog around two rectangular tables. This worked, too. A problem is projected on the board. 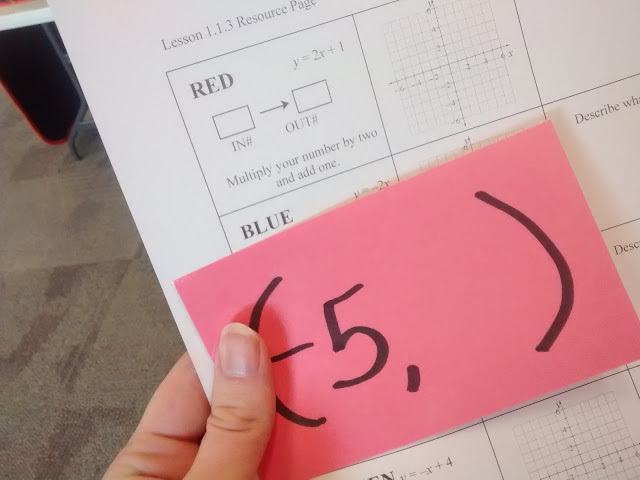 When a student figures out the answer (or what they think the answer is) they grab the answer card and hide it so none of their neighbors can see. When time is called, each person compares the answer card in their hand with the answer card in their neighbor's hand. The teacher announces the correct answer. Everyone returns their answer card to the deck in front of them. Those students who got the answer correct stand and rotate desks to the right. The goal of the game is to be the first student to make it all the way back to where you started by "leap frogging" over other players. 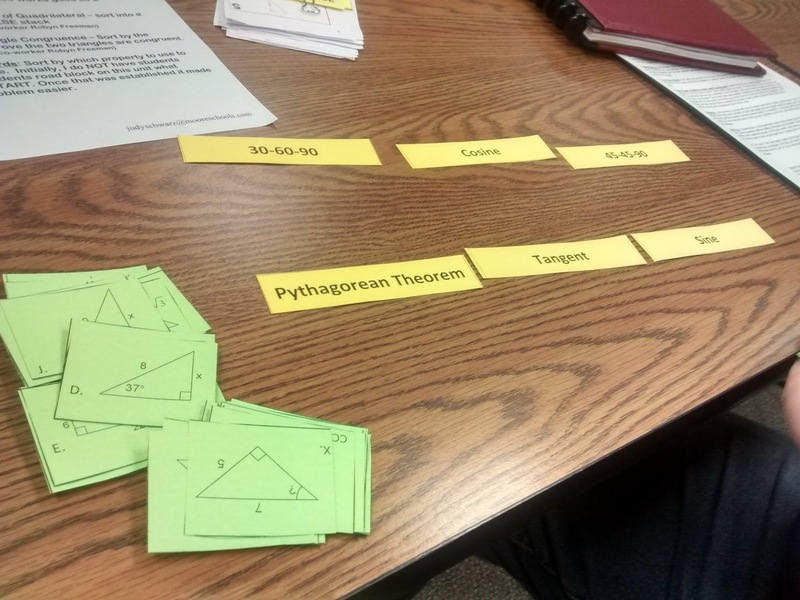 The facilitator said she has used this with great success with her Pre-AP Geometry classes. 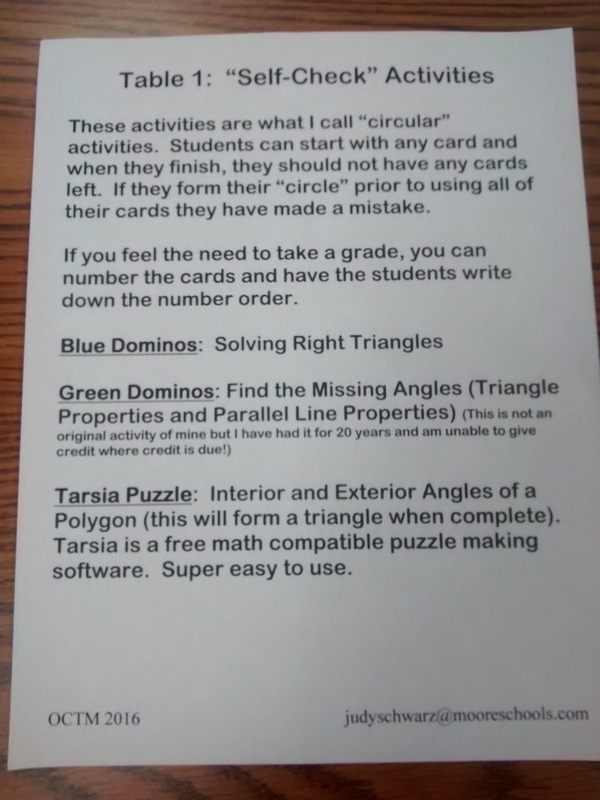 I can definitely see the competitive nature of this activity working for more advanced students. 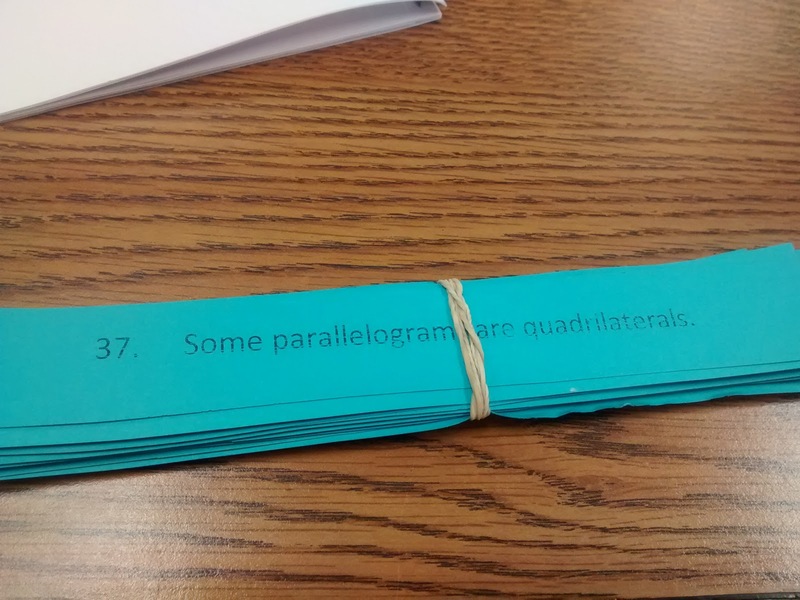 But, I'm not sure if I'd want to use this with my Algebra 1 classes. I can see my IEP students getting very, very frustrated. My trig and statistics classes, on the other hand, would probably have a lot of fun with this. 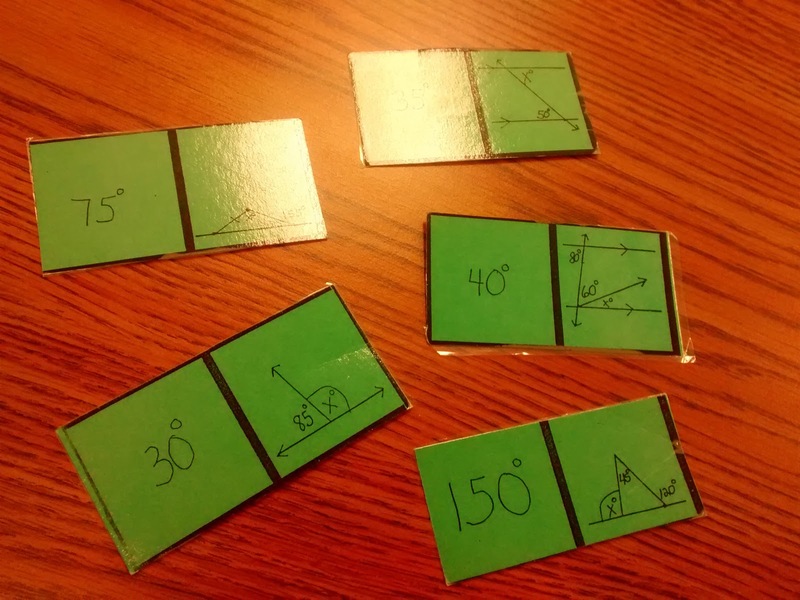 Some of the audience members expressed that making up a deck of cards was too much work, and they suggested having students write their answers on a dry erase board. One other concern I have with this activity is that I think it might be a tad bit too easy for students to cheat. I was sitting right next to Shaun, and it would have been very easy to just wait for him to pick up his answer and pick up the same answer. 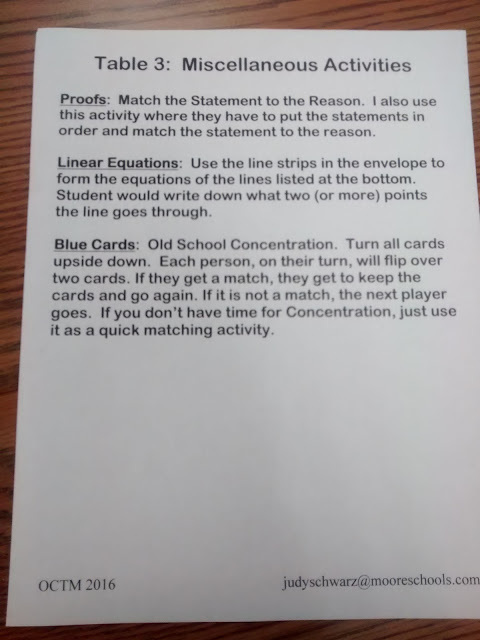 Of course, students can cheat with many review games by just looking at what their neighbors are doing. I guess the only person they are punishing is themselves. The last few things we did during the hour-long workshop was to circulate between three tables with more ideas of practice activities that don't involve just doing a worksheet. Each table had a sheet explaining each activity. Instead of trying to put each activity into my own words, I'm just posting the picture I took of each sheet. I really liked having the line on a transparency where students could just move it around. I thought this was super clever! And, that's a wrap. This was such an awesome session to attend! 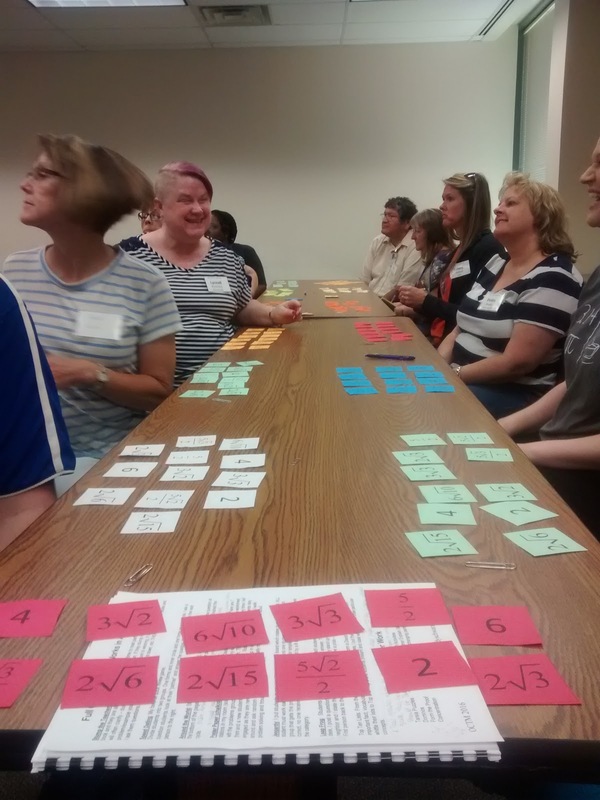 This is my second blog post recapping sessions Shaun and I attended last week at the Oklahoma Council of Teachers of Mathematics Summer Conference. 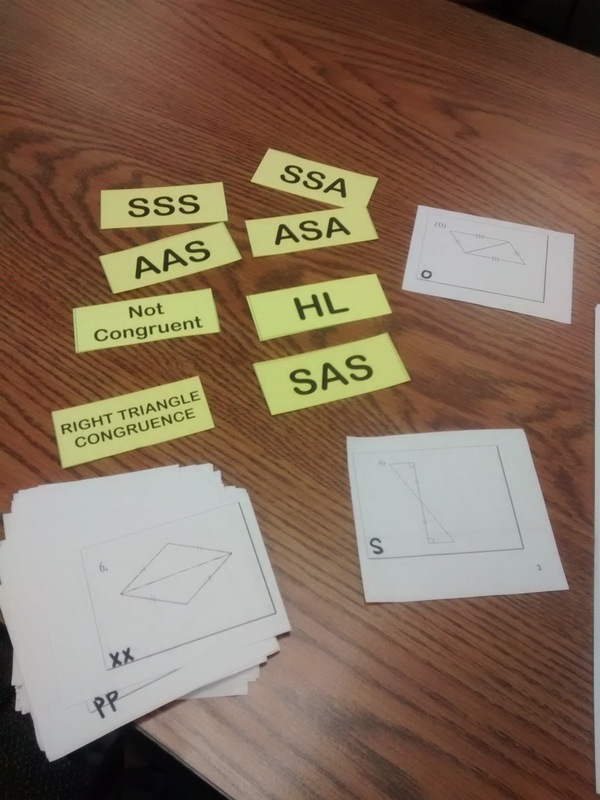 Be sure to check out my previous post on High Yield Geometry Routines! The second session we chose was called Fun Functions by CPM. I was shocked at just how many teachers in the room voted that this was most definitely not a function. Then, I started thinking about what my students would say if I gave them this question. The thought was not pretty. My kids need to know more about functions than just the vertical line test! The first activity we did was to order function machines. CPM has posted these function machines as a free PDF on their website if you're interested. Our task was to arrange the functions so that when a 6 was dropped in the first function machine that the last machine's output would be 11. 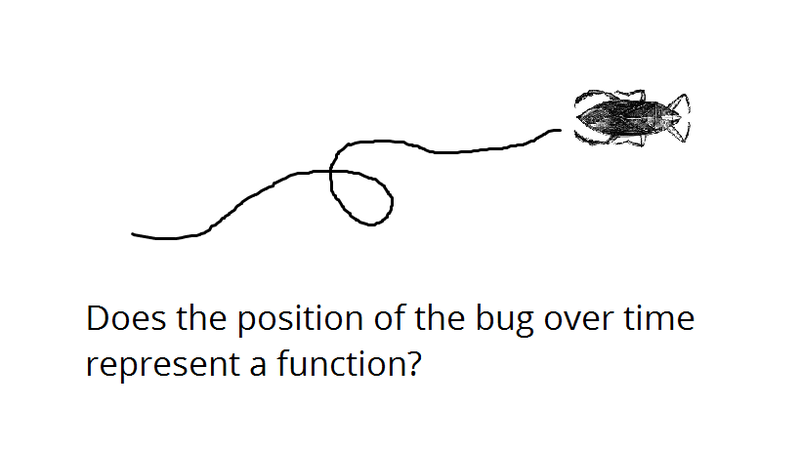 This led to some good conversation in our group about which functions couldn't be last. 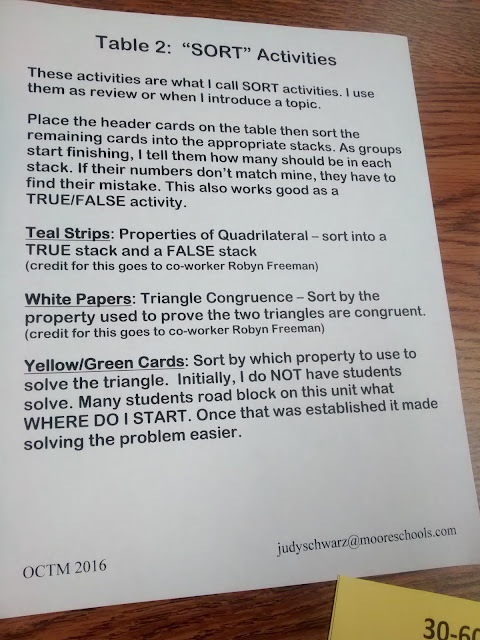 CPM also has a PDF version of this activity with an easier set of functions that I plan on using with my Algebra 1 students this year. Next, we moved on to an activity called silent board game. The idea is that the teacher puts up an incomplete input/output table. I got this image from page 8 of this file from CPM that features several pre-made Silent Board Game tables. As we played the game, I realized it truly was a silent board game. The facilitator would hold up her dry erase marker until someone raised their hand. Then, she would hand them the dry erase marker. 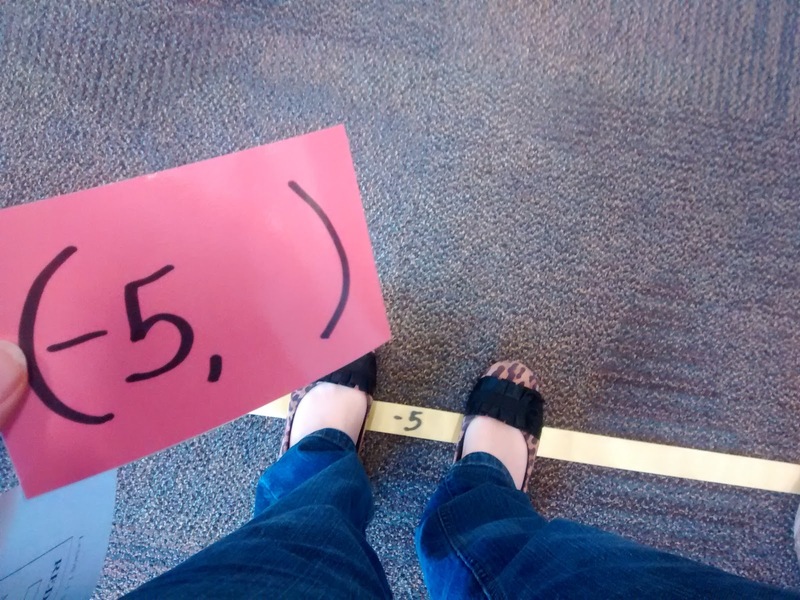 They would walk to the board and fill in an output value. If the output value was correct, there would be silence. IF the output value was incorrect, there would still be silence. But, the teacher would walk to the board and erase the incorrect value. This continued until the board was filled. 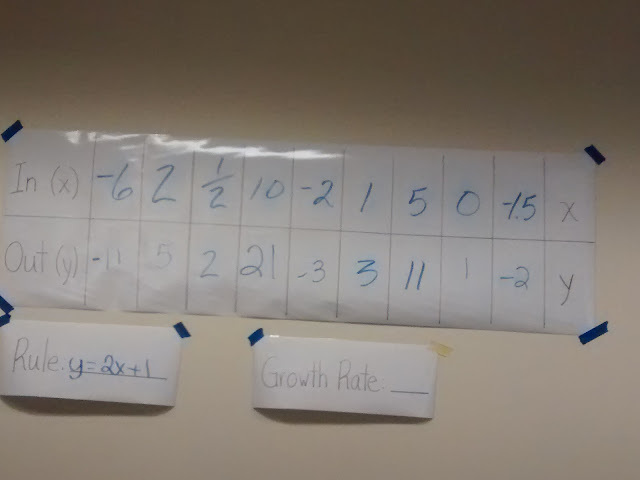 Then, we moved on and silently filled in the rule for the function and the functions' growth rate. 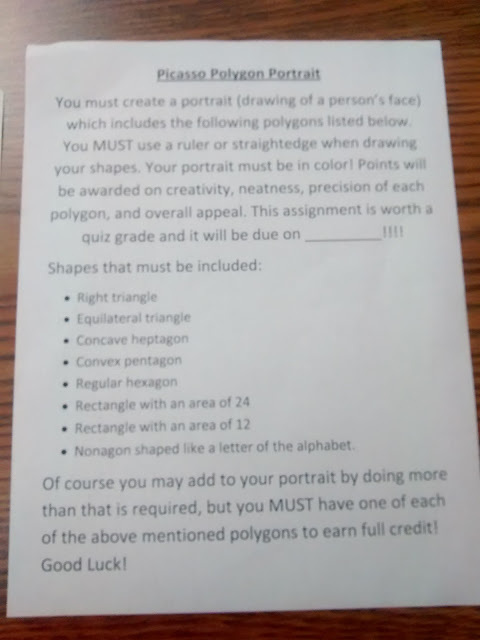 I'm honestly not sure how this activity would play out in my classroom. Would my students stay silent and engaged the entire time??? One participant in the session suggested a tweak to this activity: have a graph where students plot each point after adding it to the table. 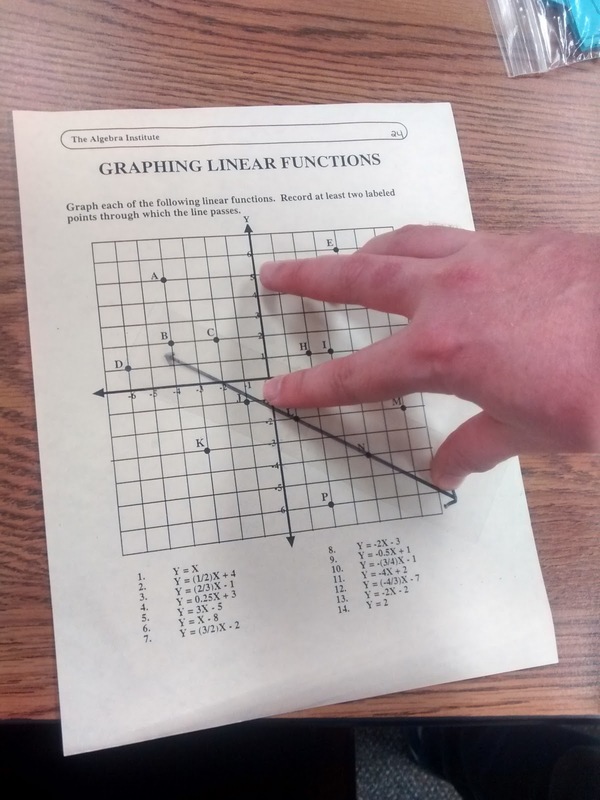 This could help students see if the function was linear, exponential, etc. After the Silent Board Game, it was time to get out of our seats and do a function walk. Our facilitator suggested that this was a great activity to get students outside. If doing it outside, she suggested that we could draw the axes of our coordinate plane with chalk. Since she works for CPM and does this presentation frequently, she had taken two rolls of ribbon and written the values on them to serve as axes. I thought this was quite ingenious! 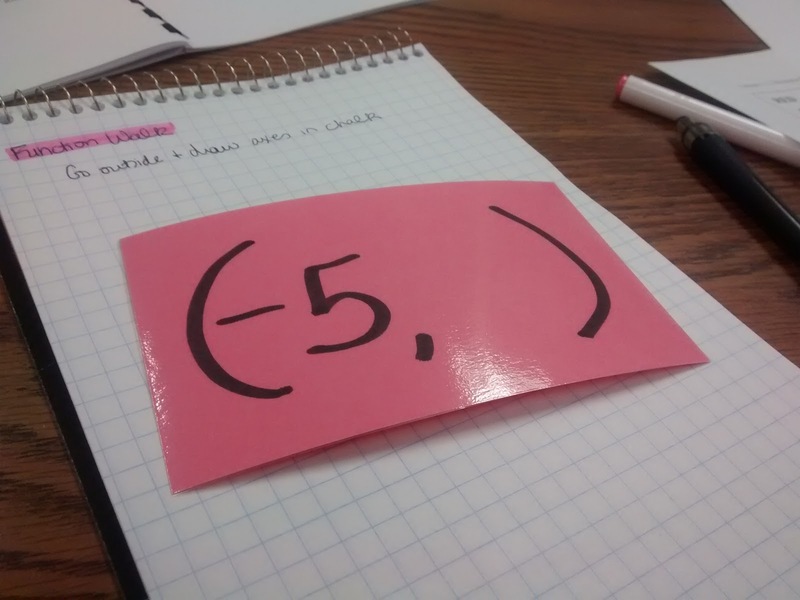 We were each given a laminated index card with an input value filled in. Different people received different colored index cards. I was in the red group. The purpose of the color-coding became clear when we got our handouts. As a person with a red card, I would be helping to graph the equation y = 2x + 1. We took turns graphing different functions. Here's my spot on the x-axis before we moved to our appropriate spots. If I end up teaching trig again this year, I think I'd definitely like to do some kinesthetic graphing of trig functions. There were several other activities in the handout that we didn't get to. A copy of the handout for this presentation can be found here. 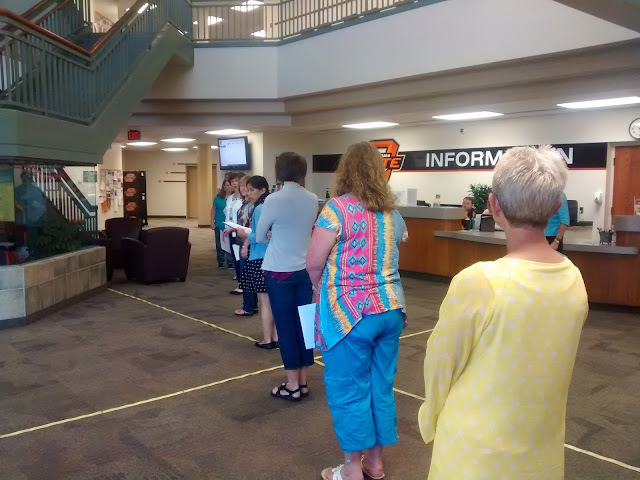 Last week, Shaun and I were able to attend the Oklahoma Council of Teachers of Mathematics Summer Workshop at OSU-Tulsa. We attended some great sessions, and I've decided that the best way to not forget what I learned is to blog about it! Over the course of the next few weeks (months?) I want to write a blog post about each session we attended and what I think were the major take-aways. The first session we attended was on high yield geometry routines, and it did not disappoint! The idea of a "high yield routine" interested both of us, and we *think* Shaun will be teaching geometry next year. Dr. Utley wasn't able to be there, but John Weaver did an excellent job demonstrating and engaging us in the high yield routines. 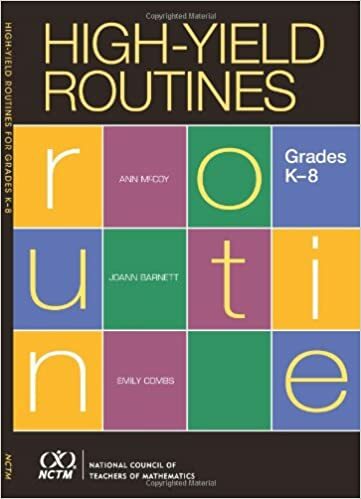 He recommended the book High-Yield Routines from NCTM (affiliate link). When I looked it up after the conference, I was sad to see it was directed at K-8. I haven't purchased it (yet) because of that reason. Is anyone familiar with it to know if it can be applied to high school? First, we heard a bit about what high yield routines lead to in the classroom. High yield routines must be used early and often to be most effective. High yield routines should be used in class from day one. High yield routines offer access to the BIG ideas of math. High yield routines offer a deep understanding of concepts. High yield routines should be used to build your classroom environment. Estimation is to Algebra as Spatial Sense is to Geometry. My first instinct was to think that we don't do that much estimation in algebra. But, then I got to thinking about how I get SO frustrated when my students arrive at an answer without checking to see if their answer is even reasonable. I need to have my students do more estimation. I need to build this into my classroom as a routine. In regards to vocabulary, I especially liked John's quote: "Vocabulary is the hill I've chosen to die on." I need to do a better job in my classroom of ensuring that students both value and use proper vocabulary. I haven't done a word wall in a few years, so I'm wondering if this should be part of my initiative again? Okay. Enough of my random thoughts for things I need to do a better job of next year. Are you ready to learn about these high yield geometry routines? This idea is based on the book Quick Draw by Grayson H. Wheatley (affiliate link). The teacher's job is to flash an image on the screen for three seconds. Then, when the image disappears, the teacher tells students to "draw what you saw." It sounds simple, but seeing it unfold in person was powerful. I looked over at Shaun's notes after we did our first Quick Draw activity, and he had written "Do this!!!" After seeing it on the screen for 3 seconds, I was able to easily draw it in my notes. I didn't need the extra 3 seconds to look at it again. Instead, I just sat there thinking "How in the world could I use this in algebra class?" What really got my attention was when John started asking people to describe what they had saw and drew. The things I was hearing others describe was not what I saw at all! I had seen a square with a triangle inside it that had a vertex at the midpoint of the top line on the square. 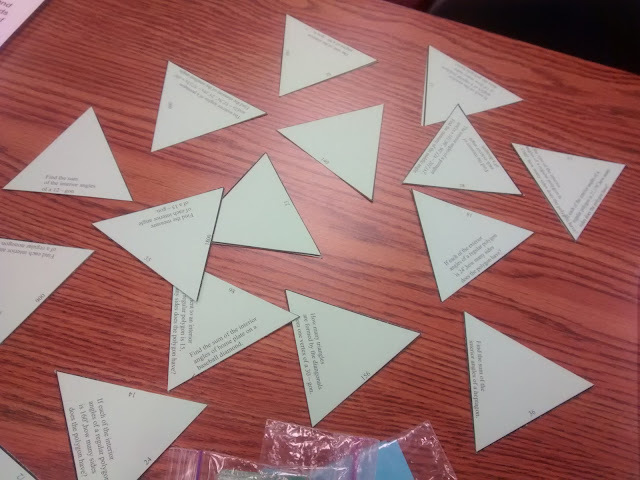 Other people were describing how they had seen an equilateral triangle with two right triangles formed from the sides of the equilateral triangle. When I realized that different people can see the same image very differently, I began to see even more potential for using this in the classroom! One more thing about the equilateral triangle thing - this led to an awesome discussion about whether the surrounding shape was a square or a rectangle and if we could prove it. 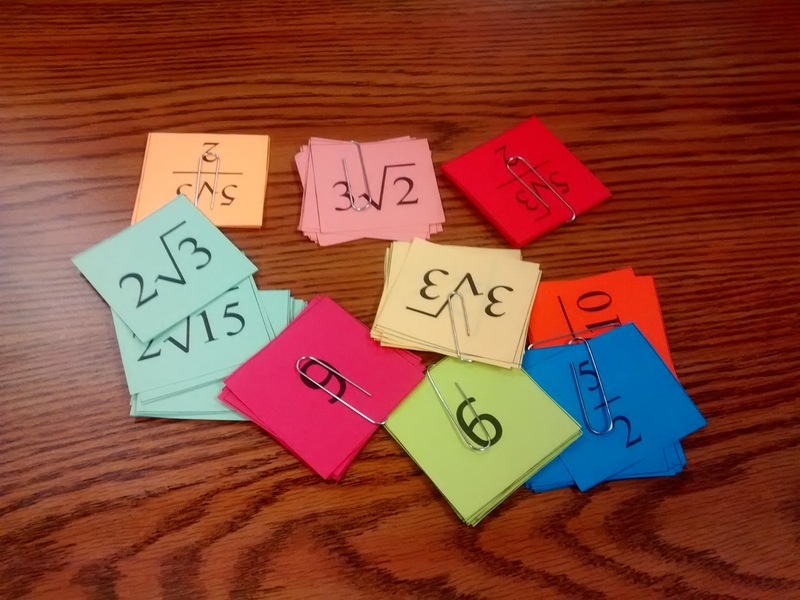 So much math talk about of a simple one minute task! Again, I'm able to draw it easily on my paper. I see a small square inside a larger square with straight lines connecting the vertices of the small square to the corresponding vertices of the larger square. Then, the facilitator starts asking others to describe what they saw. I'm blown away when others start describing seeing 3-D objects. One lady saw a "room." Another lady saw a truncated pyramid. Yet another person saw a lamp shade. I did some searching online and found a few more sources of quick draw images if you want to try them out in your classroom before investing in the book. 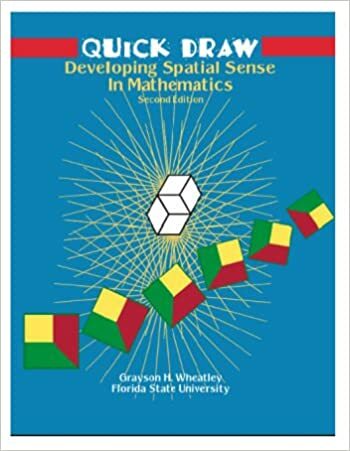 A summary of Quick Draw by the author - includes a video of the structure in action! 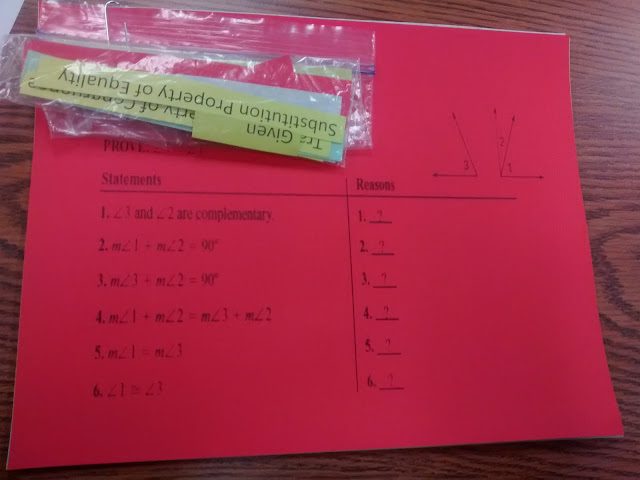 I was so impressed with how much geometry vocabulary and math talk came out of this simple routine. I can definitely see how this is an activity that can be used throughout the year to gauge how students' vocabularies and spatial senses are developing. 1. 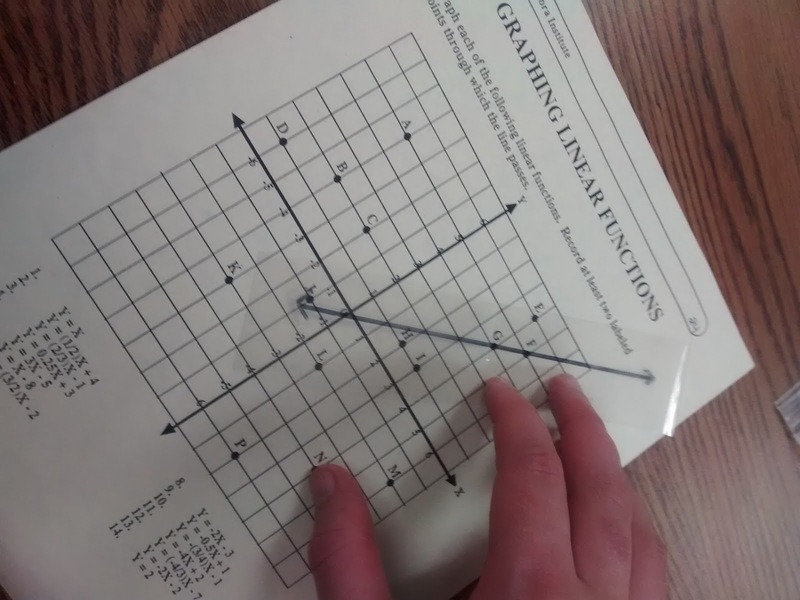 Have students construct the image on a geoboard. This would make it easier to discern between squares and rectangles. 2. 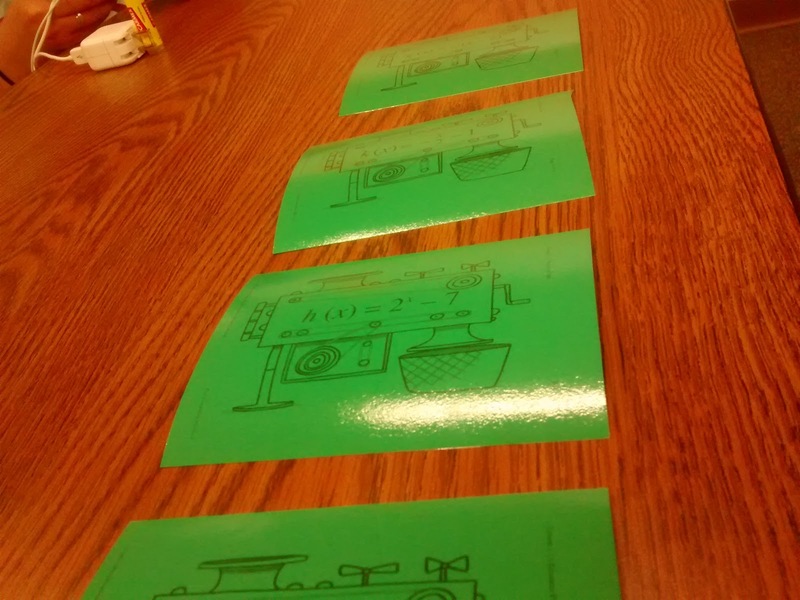 Instead of asking students to describe what they saw, have a student describe to the teacher how to draw the image on the board. We also talked about a variation of Quick Draw known as Quick Build. When we had entered the room where the workshop was, we had been given a set of 5 snap cubes. We were all immediately curious about what the snap cubes might be used for. Just like with Quick Draw, the object (or picture of it) will be shown to students for 3 seconds. Then, it will be taken away so they have a chance to draw it/build it. Show students the image for another 3 seconds for them to fix their drawings. Have students draw the "top view" of the figure. Have students determine the volume of the figure. Have students determine the surface area of the figure. I'm sure there are many other options, but these are the only ones we discussed. At the bottom of this article, there is a video of this activity taking place in a classroom. I'm really sad I didn't think to take any pictures of this activity while it was being presented. So, I'll try to explain it to the best of my ability. 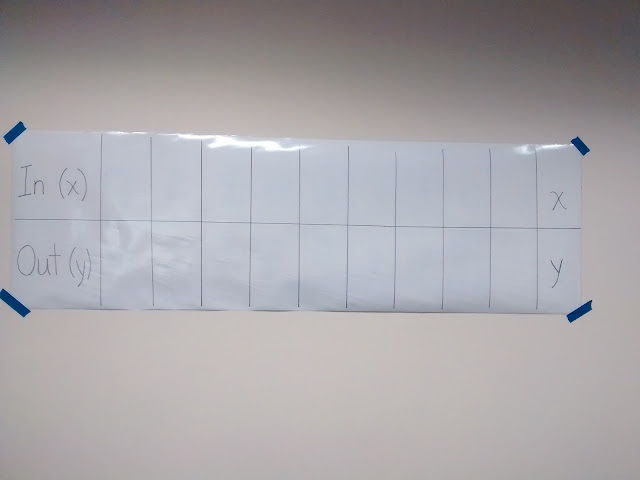 Hold up a sheet of paper to your students. Fold it in half with the top edge of the paper coming down to meet the bottom edge of the paper. Whenever you do this activity, the fold should always be at the top. Take a pair of scissors and cut the folded paper. 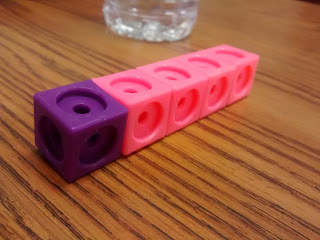 Our facilitator cut a triangle off one corner, a square out of the bottom, and a quarter-circle out of another corner. Then, it was our turn. Draw what the paper would look like when it was unfolded. We repeated the activity with a paper that had been folded into fourths. We were warned to NOT ask students to share strategies with this activity. 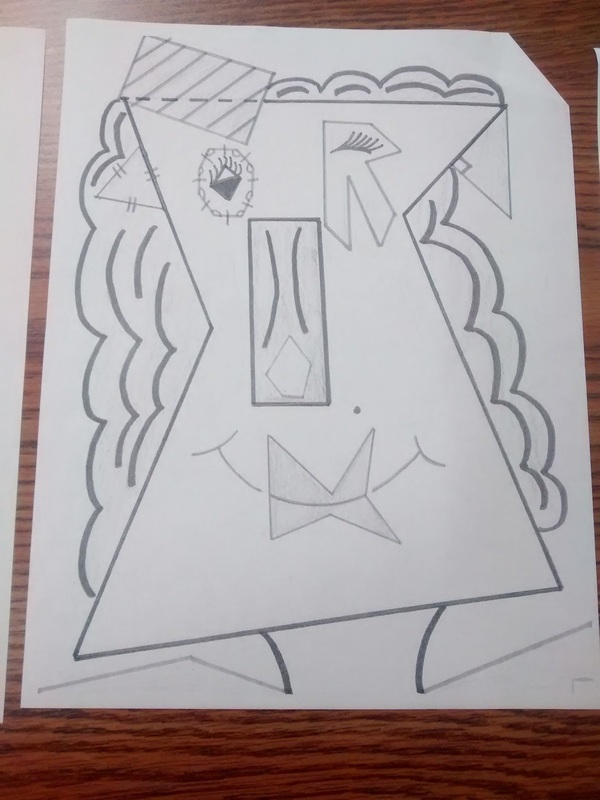 Some students will discover that they can simply draw what the folded paper looks like and then perform a reflection/rotation of that image to end up with what the unfolded paper will look like. While this is awesome, once students start doing this the activity will lose a lot of its charm. 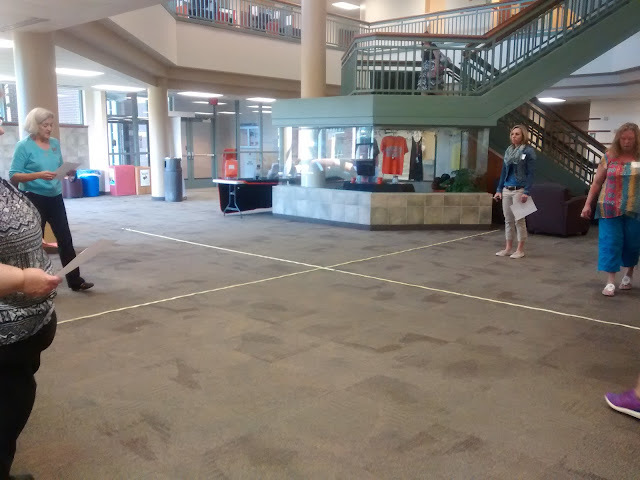 Another activity we discussed was called "Where's Polygon." I've included the instructions from the presentation below, but here's the general gist of it. Display a blank coordinate plane for students to see. At the conference, this was done with a document camera. If you have access to a projector, you could use different colored dry erase markers on the board. If you have a SMARTBoard, just project the coordinate plane on there. Before beginning, have a specific polygon in mind - exact coordinates! Your color coding will feature four colors. One color for points outside of your polygon. Another color for points inside of your polygon. Yet another color for points on the edge of your polygon. And, a final color for the vertices of your polygon. As students call out ordered pairs, color them accordingly. This continues until all the vertices of the polygon are found. Now that circles have moved to the Oklahoma geometry standards, I think it would be fun to throw a circle into this activity to see how students react. Of course, a circle isn't a polygon, so that would be a bit mean... I see such potential for this routine to grow with students throughout geometry class. This activity pulls from an awesome problem found in Michael Serra's Discovering Geometry (affiliate link) text. 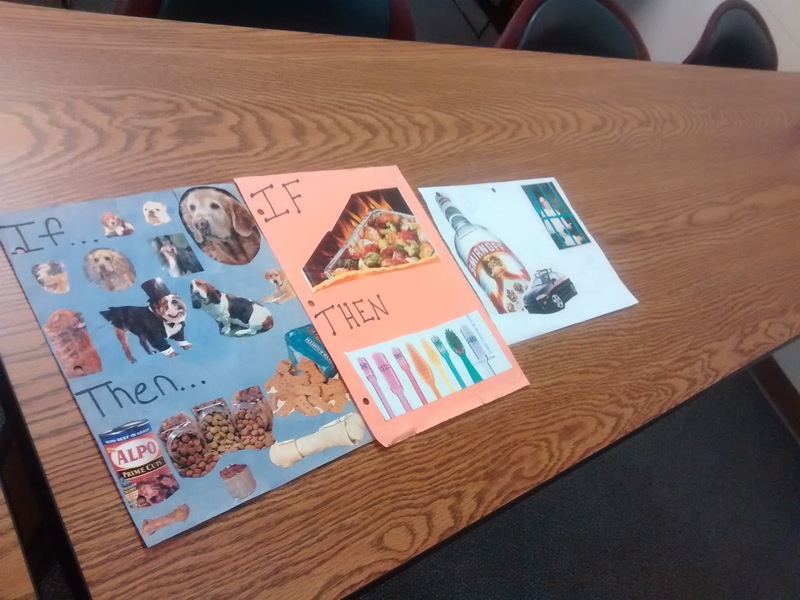 Students are given a set of images that are examples of widgets and a set of images that are non-examples of widgets. Then, they are asked to determine if other images are or are not widgets. Next, we saw how we could use polygons to make our own problems like this. Sadly, I never got to figure out what John's rule was because we ran out of time. There were a few more routines in the presentation that we didn't get a chance to get to, so I'm afraid I don't have all of the details. There were slides for them in the original presentation, but I had trouble filling in the missing pieces myself. You can find the entire presentation here (open the folder titled High Yield Geometry Routines).